Don’t be fooled by the price tag. Project Office Live is a powerful, configurable, professional system with an incredible feature set. Make sure you are sitting down, then scroll down to learn what Project Office Live provides. Familiar Office design means users already ‘know’ the system & will be entering timesheets in seconds. Allows for review and approval of timesheet to increase accuracy. 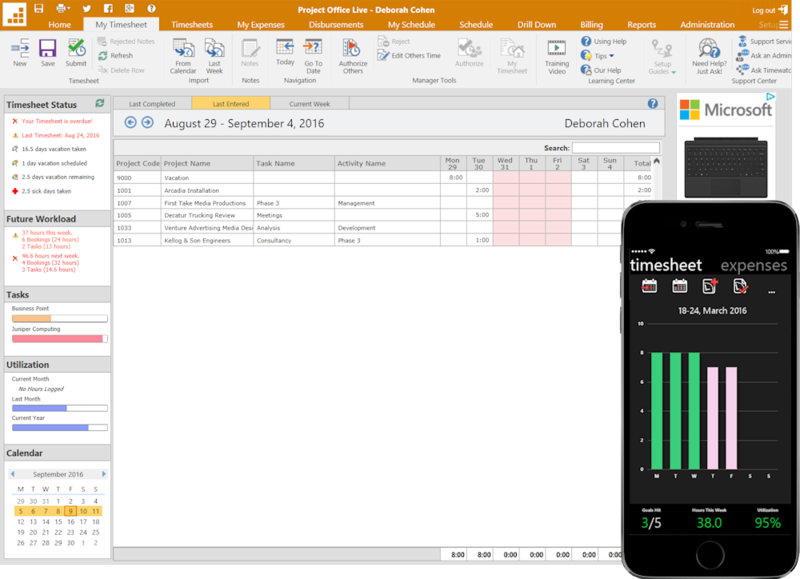 The Project Office Live Timesheet supports PCs, Macs, iPhone, iPad & Android. The Office style Tab and Ribbon menu means anyone familiar with MS-Office on PC or Mac is instantly at home with Project Office Live. From the timesheet status,users receive alerts of late timesheets, details of vacation time taken, remaining and scheduled. Future workload summarizes upcoming items in the user’s calendar and their current availability. Where project tasks are used, this area summarizes work commitments and highlights issues. The bar represents %age complete and the color indicates completion likelihood based on current availability: green means the task can be completed on time, orange means availability is tight and completion on-time is at risk, red means that at current availability, the task cannot be completed on time. Displays the current utilization stats for last month and the year to date for this employee. Navigating the timesheet is easy. Users can go back or forth by week, jump to last entered, last completed, the current week, or a specific date. From the traditional timesheet grid, users can enter new time lines, import from their calendar, copy last weeks assignments, choose from an auto generated ‘commonly used projects’ list, browse projects by customer or name. The red background highlights days that do not meet minium requirements. The highlight color is also used in the mobile timesheet. The intuitive mobile timesheet (phone & tablet) combines reporting and data entry together. Swipe left and right to see various weeks, tap on a day to review or add time, tap add to add a timeline. It’s so easy. The mobile dashboard summarizes days complete in a week, hours entered and %age complete so that everyone knows exactly what the need to do. If you enable Expenses, users can also enter expenses from their phone, tablet or PC. Multiple time saving features, typically save users 4 hours a week. That’s like adding 10% more staff for free. Project Office Live comes with powerful reports, excel exports, even auto alerts for late timesheet offenders. Intuitive design ensures the powerful scheduling features are easy to learn & use. Multi-resource, color-coded views allow schedulers to view resource calendars side by side, instantly locate available slots, make bookings etc. it’s all here. Yes, you can drag & drop across resources, we can even ensure bookings aren’t moved to employees that don’t have necessary skills. Schedulers will be right at home with the Office Ribbon Menu. From here they have all of the core scheduling features at their finger tips. Schedulers can create any number of ‘Views’ to help them see resources by team, by office, by skill or any number of custom groups. These ‘View Control’ buttons allow schedulers to set the number of days in view and the height of each resource so they can control how many resources they see on 1 screen. Incredible flexibility with detailed and summary resource views, resource group views, customer views and project views. Inbuilt Learning mode, Learning Center and Support Centers deliver a multitude of free learning tools. Once an expert, users can turn off learning mode. Navigation is simple and easy. Scroll left or right, or jump to a specific date via the Navigation button on the menu. The Resource label can include a photo (we recognize images faster than names) as well as a gauge showing the number of hours free in the current view (15 in this case) and a bar chart of availability for the next 6 weeks. The availability bar chart shows that Cynthia’s availability is tight this week and next, but that she has availability in weeks 3, 4, 5 & 6. Bookings can be color coded by type. Here, blue is ‘Consultancy’, red is ‘Vacation’ and grey is ‘Administration’. You setup your own types and color scheme. 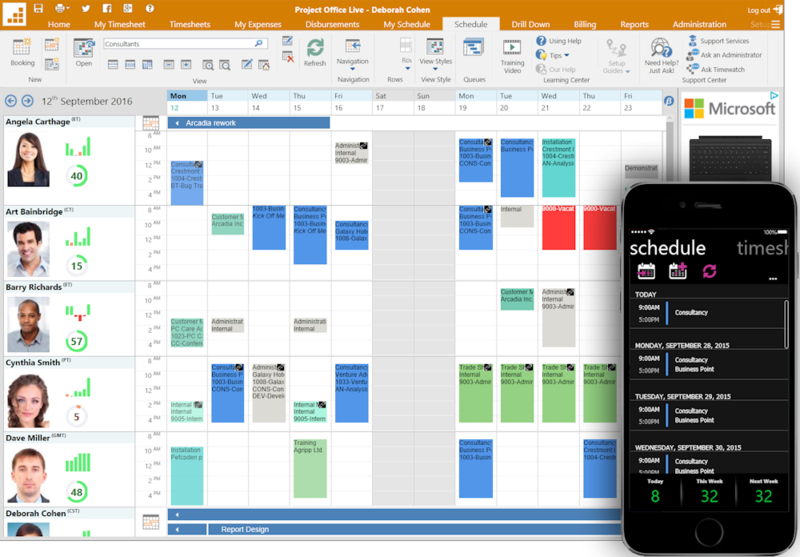 Project Office Live is unique in that it manages both tradition diary appointments AND project commitments which is like combining Outlook with MS-Project. Project Office Live Bookings hold more information than traditional systems. Typical items are customer, project and project sub tasks, but you can create custom fields to help manage resources better. For example: a purchase order number, a contact name, anything you want. Automatically publishes employees’ schedules to their Outlook and Google calendars on all devices. Includes powerful scheduling, availability & utilization reports. Project Office Live saves schedulers hours each day, helps them schedule resources better and through better utilization, increases available time without hiring more staff. Join today. You’re at lunch, catching a taxi, a plane… just snap a phot of the receipt and post to expenses. Done! Allows for review, return for correction and approval of expenses. PC, Mac, phone or tablet, it doesn’t matter. Enter expenses from any device. As expenses runs on all devices, use your phone camera, emails, pdfs, scans, whatever you have, it’s a receipt. 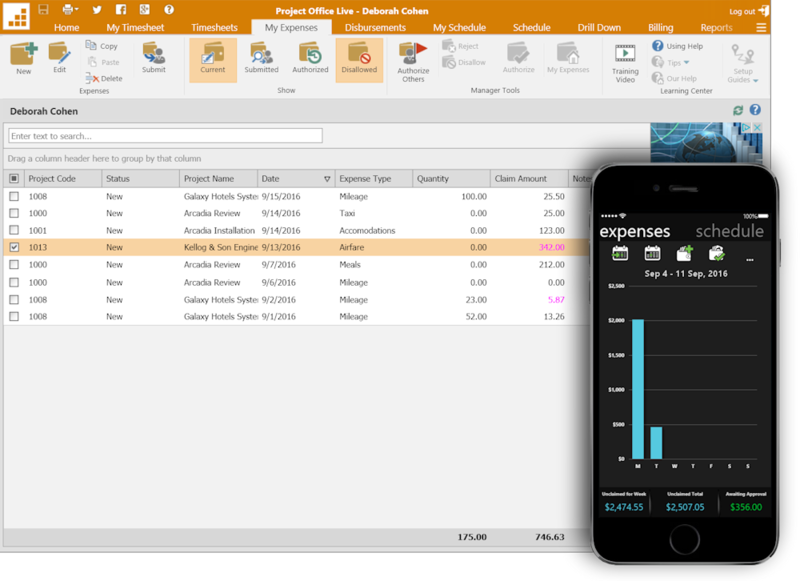 Users are instantly familiar with expenses via the office ribbon menu, which puts all expenses entry features at users fingertips. Users can edit expenses prior to posting. These filters allow users to configure what is visible in their expense grid. They can choose any combination of current, unsubmitted expenses, submitted expenses awaiting approval, authorized and disallowed items. 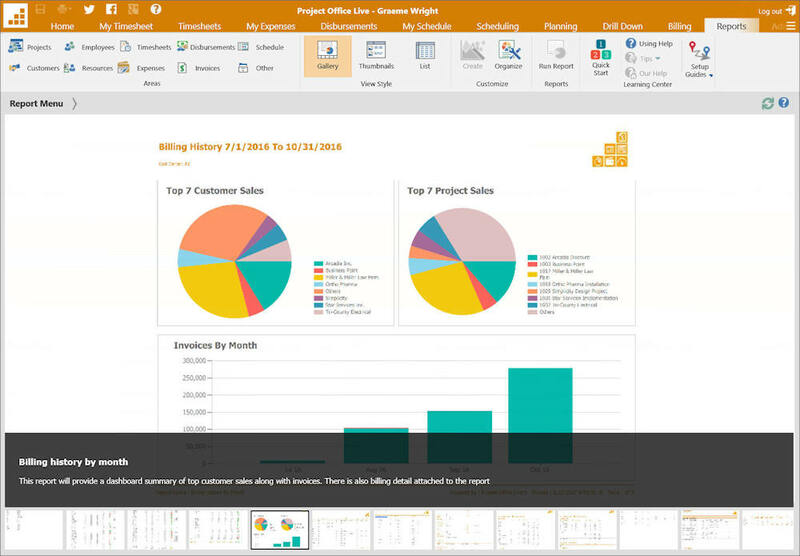 Manager approval is built in to Project Office Live. When the ‘authorize’ button is active, this manager has expenses to approve. Drag a column here to group expenses by that field. Check all or specific expenses, then click Submit in the menu to send them to a manager for approval. Click New to enter a new expense claim. Runs on mobile phones and tablets. Mobile app chart provides both expense entry and reporting in one. Tap on an expense item to view it, or tap on a blank area to add a new expense – then snap a photo of the receipt. Done! Dashboard shows expenses entered by not claimed and expenses awaiting approval. Employees save hours each week, as do Managers, Approvers, Administrators and Billing Staff. Or you could use paper or spreadsheets! If you use billing, expenses are automatically available to be charged to projects. We get it. A project office can’t automate billing. You need a list of what could be billed for you to review and decide what to bill. Which is exactly what we do. There are many standard invoice formats to choose from, but if you want a specific format, our professional services team can help. Project Office Live takes direction from you. From the rates you use, to how you bill: time & materials, fixed price, milestone or date based billing, or a mixture. It the ‘suggests’ what is available to bill, you decide what you want to bill. 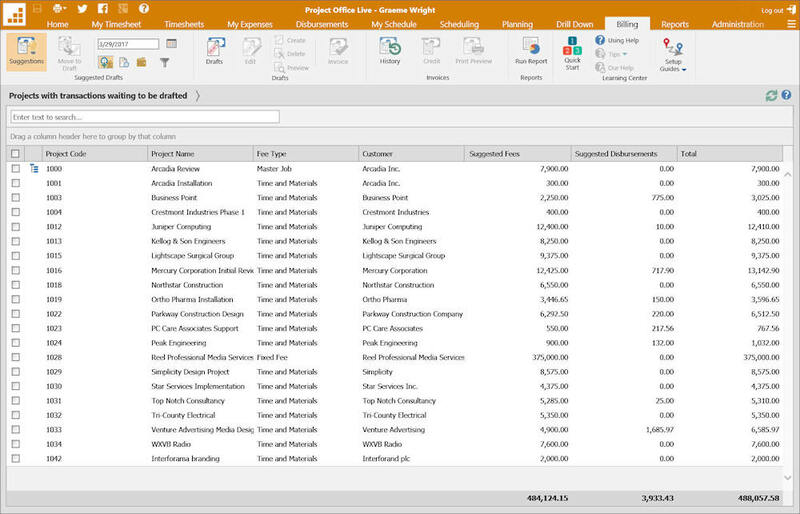 Billing is simple and easy with Project Office Live. It all starts with a ‘suggestion’ of what is available to be billed. Simply click on a project or projects to start the process of billing, this creates a draft invoice which can be edited and amended before it is ‘Invoiced’. In Drafts, users can amend the transactions: uplift, discount, write off or delay transactions to be billed. Text on invoices can be edited and there are many invoice templates that can be chosen. Once a draft has been finalized, it is ‘invoiced’. This 3 step process: suggest, amend then invoice allows organizations to delegate these processed to different people to facilitate an approval process, or to single individuals if that is how your organization operates. Once Invoices have been raised they appear in Invoices, where they can be re-printed, reviewed or if needed, credited. From here you can run various reports on invoices. The reports that are available here are configurable within the Reports Tab. Looking for a specific customer, project, job or value? use the search facility! Billing is powerful and configurable. Through the setup guides and Support Forum, users can learn all about billing and how to use it. The invoice grid is a simple and easy way to see all projects that are available to be billed. The ‘filters’ buttons help separate the ‘wheat from the chaff’. Reduce the number of projects available to be billed to just Time, just materials or both, and the filter button activates the filter facility within the billing grid – you can then use set critera such as projects with more than $1,000, customer = XYZ etc. Designed by people like you, manager approval follows what happens in real life – project and account managers to review invoices, mark them up and pass them to accounts for final approval and billing. It’s the first question everyone asks – yes, you can export data to Excel. Project Office Live reports includes a library of traditional tabular reports as well as charts and graphs. Yes! The system comes with a standard report set, as well as an ever growning advanced library of report you can add to your menus. Locating reports is simple and easy in Project Office Live. Reports are grouped by Area, and the gallery view shows a preview of each report. There are three report list styles. The one shown here is the ‘Gallery’, which shows a preview of each report with a brief description, and a thumbnail viewer at the bottom so users can quickly browse through reports. Other styles include a Thumbnail view and a list view. Just click on a report to run it. The Organize function allows managers to: add and remove reports, edit their name, the Area they appear in, their description, preview & thumbnail images, configure which users can view each report as well as attach reports to the Reports Button in the various Tab Menus. Locating and running reports is easy too. The reports ‘Gallery’ allows user to flick through their reports to locate the one they want, then just tap or click to run it. Alternatively users can search by name in the list and thumbnail views. In ‘Gallery’ preview mode, each report is displayed with a brief description. Just click on the report to run it. The thumbnail menu shows a smaller preview of other reports, just click on a report to view more details, then click on that report to run it. Project Office Live reports are very powerful, but rest assured you can set security rights to manage which users have access to which reports. Want more? We have more: an optional, interactive, drill-down data interrogation tool. Ideal for hands on CEO’s, Managers and Administrators, drill downs allow you to drill down from a high level summary, right down to the underlying transactions in real time.